Product #31093 | SKU TLM 107 - NICKEL | 0.0 (no ratings yet) Thanks for your rating! 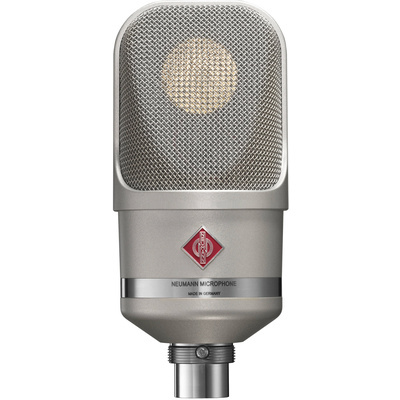 The nickel Neumann TLM 107 is a high-quality, flexible large diaphragm condenser microphone with five selectable polar patterns that is designed to accommodate a wide variety of professional studio, broadcast and demanding home recording applications. The TLM 107 is engineered with a transformerless design that permits a high degree of linearity and a large dynamic range. Featuring selectable omnidirectional, wide angle cardioid, cardioid, hypercardioid and figure-8 polar patterns, this microphone is suitable for a wide range of miking techniques and configurations. The mic also features -6dB and -12dB pads that can be engaged for recording louder sound sources such as brass or guitar amplifiers. Additionally, it has selectable high-pass filters at both 40 Hz and 100 Hz for filtering out unwanted low frequencies to save you time when mixing.